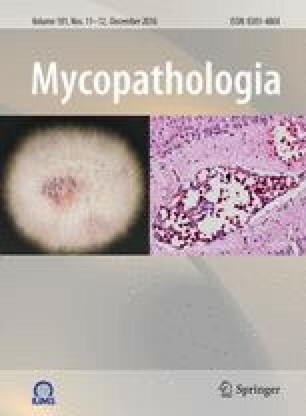 We have studied the aflatoxin producing capacity of 41 Aspergillus flavus strains isolated from the mycoflora present of natural media (wheat, rice and mixed feed) synthetic medium (Aflatoxin Producing Ability Medium) and semisynthetic media (Coconut Agar Medium and Glucose Yeast Extract Agar) were compared. Aflatoxins were analysed on days 4 and 8 post-inoculation under an incubation temperature of 28 °C. A total of 30 strains (75.7%) were producers on natural media as detected by Thin Layer Chromatography: 23 strains on wheat, 27 on rice and 12 on mixed feed. The results by qualitative flourescence tests on synthetic and semisynthetic media were: 3 strains positive on Coconut Agar Medium (CAM) 1 on Glucose Yeast Extract Agar (GY + Agar) and none on Aflatoxin Producing Ability Medium (APA).